Soak olives in cold water for 15 minutes to reduce brininess. Drain, and pat dry. Stuff each with blue cheese. Put flour, egg, and breadcrumbs in 3 bowls. 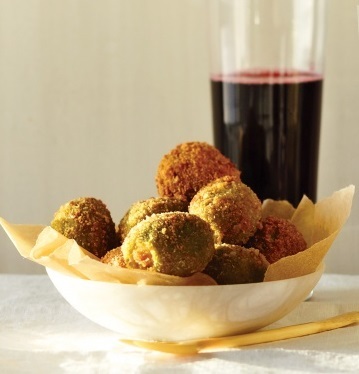 Dredge olives in flour, dip in egg, then dredge in breadcrumbs. Refrigerate until ready to fry. Heat vegetable oil in a saucepan over medium until hot but not smoking. Working in batches, fry olives until golden, about 1 1/2 minutes. Transfer to a paper-towel-lined plate using a slotted spoon. Serve warm.